So when that LSR is getting you down, when you’re feeling tired, and you’re still achy after that hilly run 5 days ago, when you need a sneaky excuse to have a little stop, what finer excuse that to take a photo? 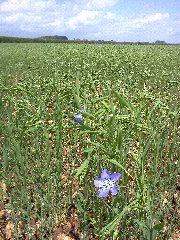 ?Not sure what is planted in this field, but it has very pretty blue flowers. If anyone knows what it is, please let me know so I can casually drop it into conversation and appear knowledgeable! Previous Previous post: Running and Geocaching. And mud. And hills. And a Cup.